Football is a favourite game here in Dubai, so naturally, the FIFA World Cup is a much awaited event. We are watching the games at home too, so it's football fever all around! Little Dude has always loved kicking the ball around, even before he could say football, so he's liking it too. 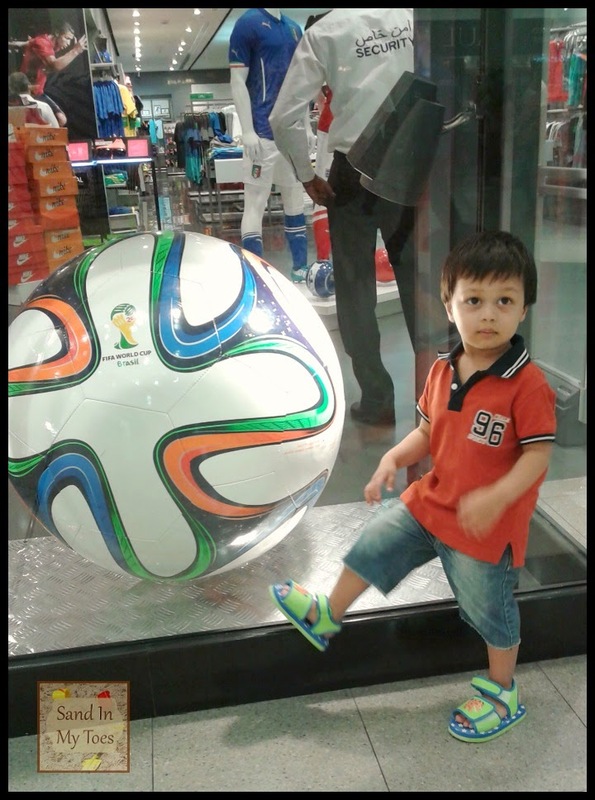 We took this photo of the official FIFA ball for 2014 at a mall. I love how it looks like Little Dude is kicking it! Lovely capture - and what a gorgeous face on Little Dude! What a cute little man! I bet he enjoyed posing for that one!! He did, although this is an impromptu shot! It is kind of inevitable with boys, but I'm a fan myself! It just sort of happened, Cheryl! Thank you, Mike! We only watch football during FIFA, really.